These healthy chicken breasts are pan-seared and then roasted until tender and juicy. They pair fantastically well with a creamy lemon caper sauce. 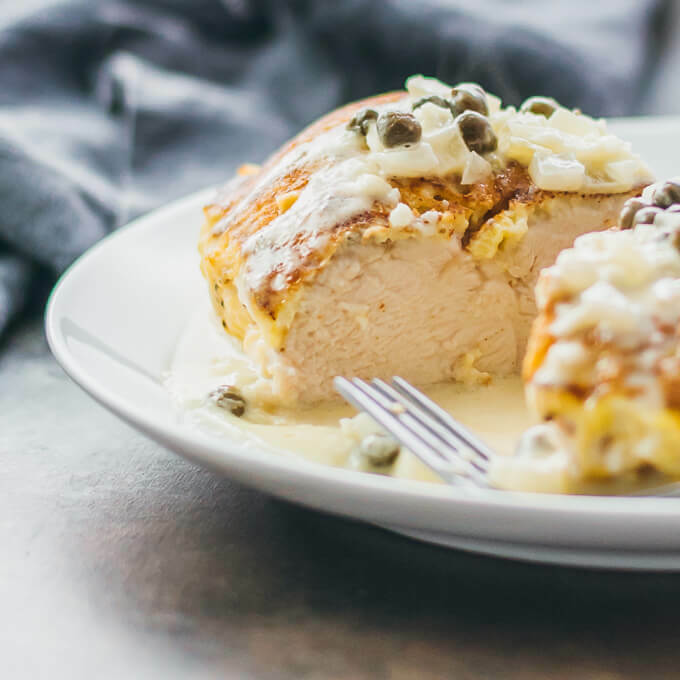 These pan fried and baked chicken breasts are a tasty and flavorful dinner that’s both comforting and low carb/keto friendly. The chicken breasts are seasoned and coated with almond flour before being dipped in egg and then fried on a hot skillet. Each side of the chicken breasts develops a nicely browned crisp skin, and then they’re transferred to the oven to roast until tender. I typically pound chicken breasts to flatten or slice horizontally through particularly thick ones; this ensures that the chicken pieces are all of the same thickness and will cook at the same rates. It takes me approximately 20 to 30 minutes to cook a 3/4 to 1 inch thick chicken breast at 350 F. I chose a low carb vegetable — zucchini “noodles” — to accompany the chicken (and to help sop up the delicious creamy sauce, of course). I don’t spiralize the zucchini myself; I usually buy pre-spiralized zucchini at Trader Joe’s or Whole Foods. To cook them, I give them a quick zap in the microwave for 30 seconds to a minute. If you don’t like zucchini, other great ideas include steamed broccoli florets. You can prepare and cook the broccoli while the chicken is baking.